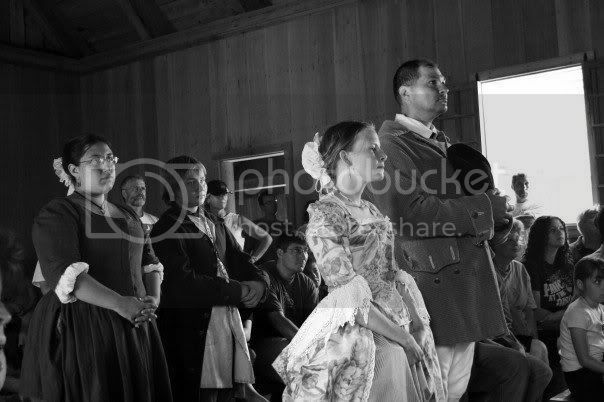 Working at Colonial Michilimackinac summer 2006 has given me many opportunities to work on costumes from the 18th century. This particular dress has been lurking in the back of my mind for a long time now and I was pleased to finally have an excuse to make it. Construction-wise, I used my basic bodice pattern that I draped for Costume Construction; same as for every other project I made for this summer. The difference is that instead of making it an open robe, I basically attached another width of fabric to the front of the skirt. 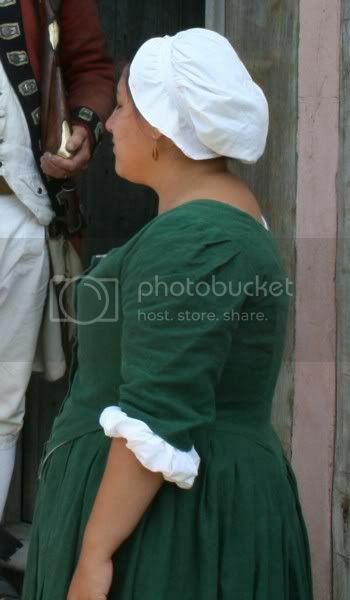 There are three widths of 60" linen in the skirt, which gives it a very nice weight; I love full skirts! 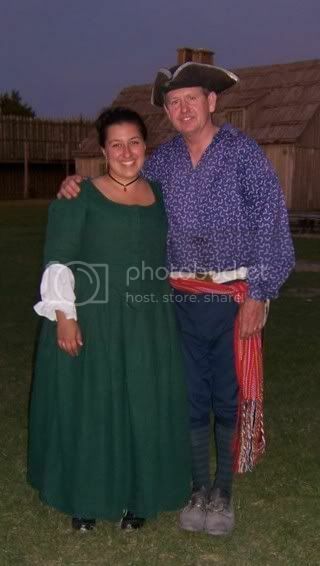 Full-length photo of me with the best boss ever, Jim. And with Julie, the only best roommate I've ever had. Oh, and she dyed the silk and made that outfit she's wearing all her own self, folks. We definitely did a lot of sewing in our room! Even fairly plain costumes look better when accessorized with a gallant redocat! 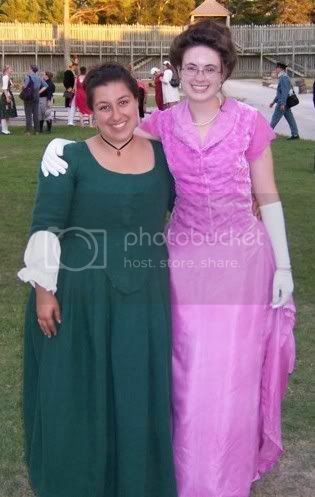 For a while, this dress also served as an alternate wedding dress for the twice-daily reenactments. This is the wedding party, getting ready to head down the aisle. 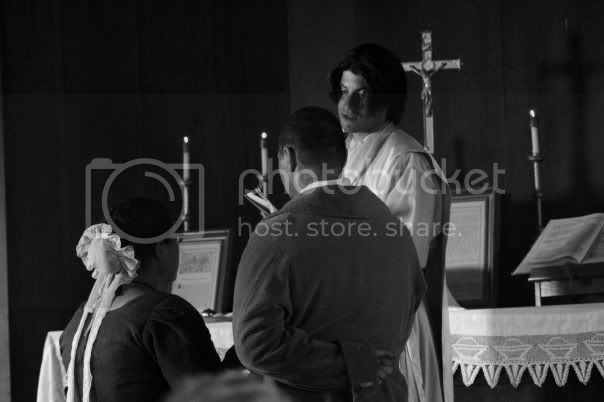 I'm playing Therese Bondy, the bride, in this particular wedding. 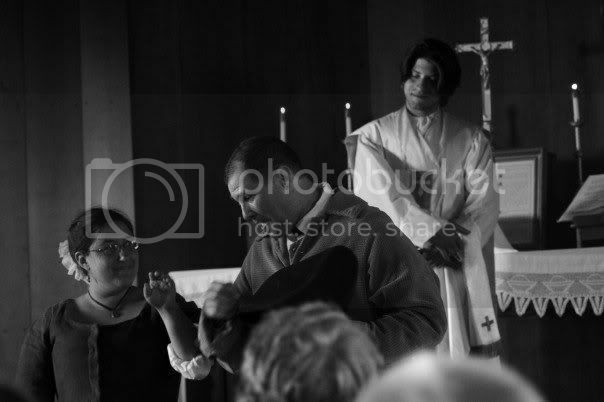 The wedding ceremony, in which Ben married me to Roger...for the fifty-millionth time that month? 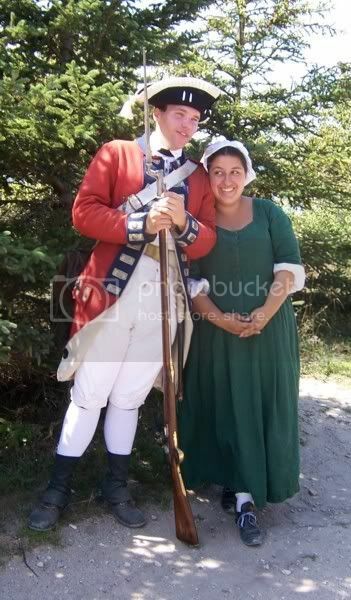 Anyway, we may or may not be cracking up in this picture--Roger and I could not marry each other without laughing. Case in point. Notice Roger trying not to laugh, me smiling, and Ben looking all beatific and stuff in the background. He wanted to laugh. Really. It's probably a good thing the wedding was over at this point. Black & white images courtesy of Catherine Clark. 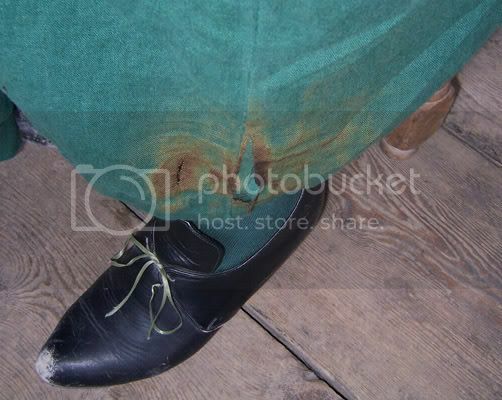 Later, the round gown was retired to work dress status, where it subsequently suffered a burn from cooking over the fire. Yeah, that's right. I lit myself on fire. Well, not on fire, per se, but did win myself a big old scorch mark.